The fourth installment of America’s answer to the James Bond series brings us to 'Mission Impossible: Ghost Protocol'. Once again, Ethan Hunt (Tom Cruise) is asked to miraculously do the impossible in an effort to prevent global destruction. With the help of his eager and able team, consisting of his loyal lap-dog Benji (Simon Pegg) and two capable side-kicks (Paula Patton and Jeremy Renner), agent Hunt must travel the world attempting to avert the rather clichéd ambitions of the nefarious Kurt Hendricks (Michael Nyqvist). The story begins in Moscow, with a rapid escalation of the stakes occurring very early on. The bulk of the action then continues in Dubai and Mumbai, with some epic and thrilling scenes that typify the essence of this franchise. It could be fair to say this movie was even more action-packed than the sequels, but it was gratifying to see that the thrill did not get in the way of a coherent, if not original, storyline. Having said that, much of the complexity of the storyline seemed to be simplified for the sake of the adrenaline-craving viewers. I almost felt as if the action scenes were detached from the overarching plot. This only served to undervalue to the importance and cunning of Hendricks as the movie’s antagonist as well as his interesting motives. Fortunately, I feel that the lack of cohesion between the action and the storyline did not detract from the brilliant performance that was displayed in the action sequences. From the giddiness experienced in the breath-taking scenes in Dubai, to the grand images of a seemingly Cold War era Moscow and the glamour of a futuristic Mumbai, the director, Brad Bird, has really pulled off mission impossible (intentional but unambitious pun). Bird's efforts were complemented brilliantly by the acting, with another unerringly comedic performance by Simon Pegg and a superb display by Tom Cruise, reminiscent of the performances that heralded his rise in popularity in the early nineties. Cruise was ably backed-up by the supporting cast with Nyqvist’s admirable if not under-used talents being the prime example. This review began with a James Bond comparison and it certainly holds true. From the gadgets and chase scenes to the astounding backdrops and the maniacal villain intent on global destruction, there is a continuous sense of urgency punctuated only by unnecessary and largely inconsequential forays into Hunt’s personal life. However, just as the Bond franchise has been driven to alter its formula, this sequel may have missed a trick by yet again sacrificing sophistication of plot for glamour. Much like the recent Sherlock Holmes sequel, die-hard fans of the Mission Impossible franchise would be thrilled by the latest instalment, especially if they were fortunate to watch it in IMAX format, though newer viewers may have found it a glamorous yet slightly vacuous experience. 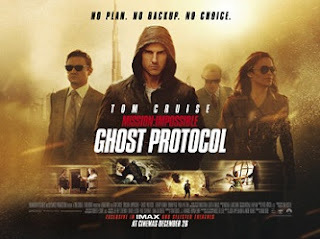 Mission: Impossible - Ghost Protocol' is on wide release across UK cinemas now.